Make every day a spa day! 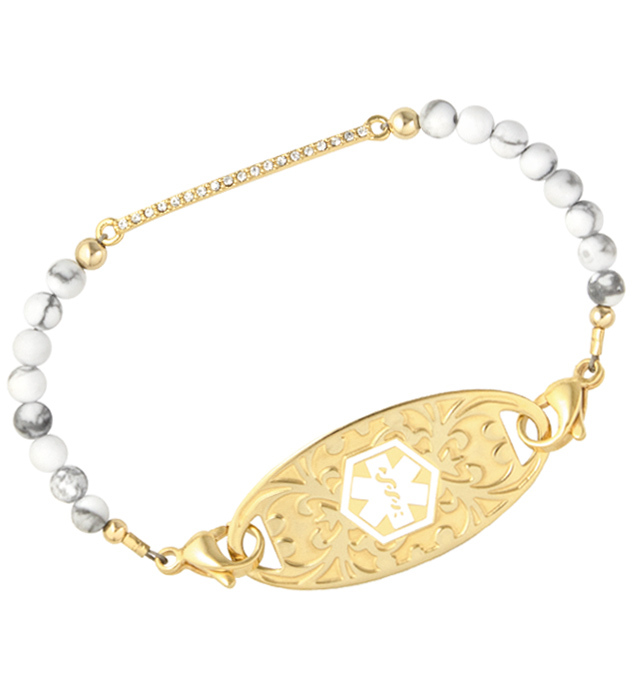 With beautifully marbled howlite beads and a 14k gold-dipped center bar adorned with pave-set crystals, the Spa Day Medical ID Bracelet is simple, stylish, and sure to become one of your favorite LH designs. Finished off with gold accent beads, Spa Day Medical ID Bracelet is designed to pair with your favorite custom-engraved LH medical ID tag for delicate look that’s hand crafted to last. Wear it alone, with a wrap, in an on-trend, stacked style! As with all of our interchangeable designs, your Spa Day Medical Alert Bracelet pairs with any custom-engraved Lauren’s Hope medical ID tag, keeping what’s truly most important to you right at hand. This stylish med ID is a great choice whether you or your loved ones wear medical alert bracelets for a history of weight loss surgery, food allergies, heart conditions, epilepsy, lymphedema or post-mastectomy care, hypertension, or any other medical condition or treatment consideration. Custom engraving allows you to choose the look you want so you can stay safe in style.